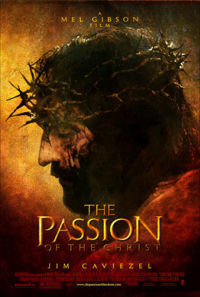 The Passion of the Christ was a movie produced by Mel Gibson and bankrolled with his own money. The film is based on the last 12 hours of the life of Jesus, as read in the Gospels. Gibson felt that God wished him to make this movie as a "repayment" for the forgiveness of God. The film opens with Jesus in the midst of an agonising struggle between his human and divine wills on the Mount of Olives. He temporarily leaves his prayers, and finds St. Peter, St. John, and another disciple sleeping against a tree. Waking them up, He demands to know why they could not watch one hour with him. They respond back with concern, asking whether they should summon the other Apostles. Jesus responds that he doesn't want them to see him in such a horrid condition and orders them to keep watching and to pray. Meanwhile, Judas Iscariot stands before Caiaphas and the Sanhedrin. Caiaphas casts him thirty silver pieces to reveal where Jesus is. Meanwhile, Jesus continues to be endlessly tempted by Satan to abandon the idea that one man can redeem the sins of the world. Jesus agonises over His coming death, but resists all temptation by calling on his Heavenly Father. Then, however, the Temple guards arrive with Judas. Jesus tells the guards, straight up, who he is. Judas then steps up and kisses Him on the cheek to identify Him further. Jesus berates Judas for betraying the Son of Man with a kiss. As Jesus is being shackled up, St. Peter attacks Malchus, one of the High Priest's servants, with his sword. The attack slices off Malchus' ear. Jesus goes to it, picks it up, and holds it against the guard's head, while ordering Peter to drop his sword. Peter does so, and we see the guard's side of his face, as though nothing happened to it. Malchus is stunned. The Apostles flee in terror. Jesus is then dragged away by the guards, leaving Malchus kneeling there, amazed and deeply touched by what has just happened. We then see the Blessed Virgin waking up from what seems to be a nightmare. Mary Magdelene is concerned and asks whether she is alright. Mary responds by quoting from the prayers of Passover, "Why is this night different than other nights?" Mary Magdalene responds, "Because once we were slaves and we are slaves no longer." Suddenly St. John bursts in, telling them both that Jesus has been arrested. As Jesus is being taken to the palace of Caiaphas, he is beaten with his chains and is repeatedly punched in the face, leaving one eye swollen shut. Judas is sitting under a bridge, when Jesus is thrown over it by the Temple guards. Judas looks on with agony and shame. At the temple, Jesus sees Mary, Magdelene, and John. Jesus then recalls a tender memory of building a table for a rich man and joking about it with his mother. We then cut back to Jesus standing before the Sanhedrin, including Caiaphas. The Virgin Mary, Mary Magdelene, St. Peter, St. John, and Judas watch from afar as the temple priests denounce every doctrine that Jesus has taught, including that he is the King of the Jews, and the events of the Last Supper. Jesus is asked if these accusations are true. He responds by speaking the ineffable Name of God and declaring further that they will see him sitting at the right hand of the Father. Horrified by Jesus's "blasphemy," Caiaphas rends his garments and screams. The infuriated priests beat Jesus and spit in His face. He is then condemned to death. A horrified St. Peter attempts to flee, but is seized by several people who point out that he is a disciple of Jesus. St. Peter denies it each of the three times it is pointed out. As Jesus turns around and bores into him with His one open eye, Peter is overwhelmed with guilt and shame. When the Blessed Virgin attempts to comfort him, Peter flees, crying that he is unworthy and bewailing what he has done. Judas goes to Caiaphas and pleads with him to release Jesus and to take back the money. However, Caiaphas refuses to accept it back, declaring that if Judas thinks he has betrayed innocent blood, it is his problem. Judas angrily throws the money on the Temple floor and runs off griefstricken. As he sits by a fire, two children approach him and ask him what's wrong. When Judas curses them, they turn into demons. They chase Judas, tormenting him as he flees outside the city walls. The next morning, Judas finds the donkey from Palm Sunday lying dead and being devoured by maggots. Unable to live with his shame, Judas hangs himself. Meanwhile, the Temple priests bring Jesus to the court of Pontius Pilate, so that he may be crucified under Roman Law. Pilate angrily demands to know whether they always punish their prisoners before they are tried. But after Caiaphas declares that Jesus has declared Himself the Messiah, Pontius privately examines Him. He offers Jesus a goblet of wine, but Jesus, having vowed to no longer drink the fruit of the vine at the Last Supper, politely declines. Pilate asks whether He is the King of the Jews. Jesus responds that His kingdom is not of this world and that if it were, His servants would never let Him be handed over to His enemies. He further declares that all who hear the truth hear His voice. Pilate cynically retorts, "What is truth?" Pilate returns to the crowd and orders the priests to bring Jesus before King Herod Antipas, because Jesus is a Nazarene, and thus one of Herod's subjects. Caiaphas angrily protests but grudgingly obeys. Herod is an effeminate bisexual, deeply impressed by reports of Jesus's miracles. But when Jesus remains silent and will not respond to his pleas to work "a little miracle for me," Herod mocks Him, laughing that Jesus is just "crazy." When the priests return him to Pilate, he is not pleased. He asks them what they feel a fair punishment would be, and the crowd, bribed by the Temple priests, scream out "Crucify him!" Pilate refuses, fearing that Jesus's followers will revolt and that the ensuing bloodshed will turn the Emperor against him. Instead, he orders Jesus to be flogged, hoping that the sight will make Caiaphas and his cronies reconsider their desire for the death penalty. At a broken pillar, two Roman soldiers are to carry out the flagellation. They each pick up wooden rods and commence brtually striking Jesus on the back with them. He is bruised, bloodied, and beaten, and sinks to his knees. The Blessed Virgin, Mary Magdelene, and St. John all watch, utterly shattered. To everyone's astonishment, Jesus wills himself back to his feet, even after the beating has exhausted the guards. They angrily put down the rods and each pick up a cat-o-nine tails, and continue. This tears up Jesus' skin and flesh to the point where his left rib cage is visible. He seems on the point of death before Abenader, the centurion who will later become St. Ctesiphon, angrily orders the flogging to cease, saying that they were not authorized to scourge him to death. The soldiers grudgingly put down their whips and release Jesus, but they have to drag him away because he is in so much physical agony. The Blessed Virgin and Mary Magdelene are presented with linen towels by Claudia Procles, Pilate's wife, who is just as crushed as they over what has just happened. They both go down to the courtyard and begin mopping the blood with the linen. Magdelene weeps as she remembers how Jesus saved her once from being stoned to death for her sins. Jesus is seen in a barn-like room, sitting against a wooden post. The two Roman soldiers who flogged him drive a crown of thorns into his scalp and spit on him. He is given a red soldier's cloak and mockingly treated with royal homage. "Hail, King of the Worms," laughs one of the guards. Jesus is then brought back to Pontius Pilate. He is disgusted by how badly beaten Jesus is. He asks the rioting crowds if they are satisfied, but Caiaphas demands more. He still demands that Jesus be crucified. In a last ditch effort to make the whole crisis go away, Pilate forces Caiaphas to choose between the release of a "notorious murderer" named Barabbas and clemency for Jesus. Caiaphas is so filled with hatred for Jesus that he cries "Release Barabbas!" Pilate disgustedly washes his hands of the whole affair and declares, "I am innocent of this man's blood." He orders Abenader to do as Caiaphas demands. We then see Jesus walking between two other thieves being crucified. The two beside him are tied to just a part of their cross—Jesus has to carry his own huge cross. Jesus embraces His cross, prompting mockery from one of the thieves. As he walks with it, he is endlessly beaten and yelled at by the crowds and the Roman soldiers alike. The Blessed Virgin, Mary Magdelene, and St. John follow him. Down a small alleyway, Jesus trips and falls with the cross. The cross crushes him, Mary runs up to her son, flashing back to a time when he fell as a small child. As she reaches him she tries to comfort him, saying, "I'm here." Jesus looks at her, and wills himself up to carry his cross, and, quoting the Book of Isaiah declares "Behold, Mother, I make all things new." He stands up and continues on his way. As Jesus keeps walking, he continues to fall under the weight of the heavy cross. The guards mock him and whip him each time. Abenader approaches again and, noting how weak Jesus has become, orders the soldiers to help Jesus carry the cross. Instead of doing it themselves, they find a man in the crowds, Simon of Cyrene, to help Him carry it. He grudgingly agrees to help. As the two keep going, Jesus falls without the cross. Simon isn't able to hold it by himself. A riot breaks out, with groups of people fighting to get a chance at beating Jesus. Guards fight them off, and as that happens, St. Veronica approaches Jesus with a cloth and a pitcher of water. Jesus uses the cloth to wipe his bloodied face with. However, as he goes to take a gulp of water, a soldier walks over and kicks the cup over, and drives Veronica away. As the procession continues the viewer sees that Veronica's veil has been imprinted with the image of His face. While the soldiers continue to beat Jesus with whips, Simon angrily threatens to not help with the cross if they don't stop what they're doing. They scornfully call him "Jew," but they grudgingly oblige. The procession continues, headed for Golgotha, or "The Place of the Skull." Once there, Simon is ordered to leave. As he is driven away, he looks into Jesus's one eye with love and pity. We see Mary, Mary Magdelene and John again. They all watch as Jesus is stretched onto the cross. They nail both of his hands, tearing his right arm out of the socket in the process in order to make it fit the pre-drilled hole for the nail. In the midst of His agony, Jesus prays for mercy for all the sinners of the world, crying "Forgive them, Father. They do not know..." They then bind and nail his feet. They flip the cross over on Jesus' frontside. However, Jesus is elevated off the ground. The guards then flip the cross back over and raise it. As the cross is raised, we are taken to a flashback of the Last Supper, considered by Roman Catholics to be the first Mass. We watch as Jesus Elevates the Host. On the cross, he is mocked by Caiaphas and the Temple priests, and by the thief to his left, who tells Him to save them all if he is truly the Son of God. Jesus prays, "Father forgive them, they known not what they do." The thief on his right tells Caiaphas, "Listen, He prays for you." The Good Thief then tells Jesus his punishment is just, and that Jesus would be justified in condemning him, but he says, "Lord, remember me when you come into your Kingdom." Jesus tells the thief "On this day, you will be with me in paradise." As the other thief cackles with laughter over this, a crow comes from the sky and plucks his left eye out. Jesus is getting weaker, and it is getting darker and darker out. Mary and John approach Jesus on his cross. Jesus declares, "I thirst!" A sympathetic Roman soldier named Cassius, later to become St. Longinus puts a sponge on a spear and soaks it in vinegar. Jesus tastes it and then turns his head aside. The Blessed Virgin pleads with Jesus to let her die with him. Jesus then tells Mary that John will now take care of her, and tells John that Mary is now his mother. Jesus then cries out in Hebrew "Father! Father! Why have you forsaken me?" Jesus then looks down upon them, saying, "It is finished." Mary Magdelene weeps. Jesus then looks upward and gasps "Father, into your hands I commend my spirit." The pupil of His one eye dilates, and He exhales his last breath. Suddenly there is a very violent earthquake. All the people run away, and the soldiers are ordered to break the criminals' legs. The Roman soldier Cassius breaks the legs of the thieves to Jesus' sides, but when he comes to break Jesus' legs, there's another tremble from the Earth. He tells Abenader that Jesus is already dead. Abenader orders him to, "Make sure." Cassius then drives a lance into Jesus's side. Blood and water pours from the wound as Cassius falls to his knees. It is at this moment that everyone, Romans and Jews alike, realize they have indeed killed the Son of God. In the depths of Hell, Satan screams in impotent rage, knowing that his power has been broken forever. That night, Jesus is removed from the cross. Mary embraces the body of her son in a manner reminiscent of Michelangelo's Pieta. She stares blankly ahead, her eyes a mirror of her broken heart. Three days later, the morning light of Easter Sunday streams into the garden tomb. As the rock rolls away, we see Jesus in healthy form. He stands up, and we see the hole in his hand from the nail. He walks out of his tomb to triumphant music, and the credits roll. Gibson was not even able to find a major distributor for his film. For a year before the movie was even released, and well before it was first previewed or seen, attacks on the movie began starting with a New York Times story attacking Gibson's father in March 2003. This turned out to be coupled with personal attacks on Mel Gibson with such titles as "Krazy Mel" and more attacks on his father and on Gibson's choice of church to worship. Calls to Gibson to denounce his father for his views, most famously in the Diane Sawyer television interview, were ignored by him. The New York Times continued with an ongoing campaign against Mel Gibson and his family. Nevertheless, the movie went on to be a blockbuster grossing over $370 million in the U.S. and over $600 million worldwide, an especially unheard of showing for the time of the year it was released . Cries of anti-Semitism were largely silenced as people saw the movie. With so many critics denouncing the movie without having seen it, Mel did an end around and went directly to church pastors, who were almost unanimously supportive and told their congregations. The movie had more pre-ticket sales than any film in history. Monetarily, it was the most successful Christian film ever. For Mel Gibson it was a personal affair. Thick-skinned by the nature of the business, he still did not expect the virulent attacks. For the star, Jim Caviezel, though he has not starred in major films, as of 2018 he is co-star of the CBS television show Person of Interest. ↑ It was released around Easter; most major films are released either in summer or near Christmas; however, the release date allowed it to capture the #1 box-office ranking on its release weekend and it would rank #1 for three additional weekends. This page was last modified on 11 January 2019, at 17:22. This page has been accessed 18,944 times.